Pour brine over garlic in jars and cover leaving at least an inch headspace in the jar. I usually make some plain jars and some spicy. You can add some red pepper flakes or ground red pepper. You could even add some grated ginger or sliced turmeric or ginger root pieces. Sliced habanero or any type of fresh hot pepper of your choice would work well too. Cover jars tightly and put in a dark spot in your kitchen or garage if you don’t live in a cold spot. Fermenting garlic can get kind of stinky, especially if it’s warm! I put mine on the kitchen counter and cover with a dark kitchen towel. Fermentation time depends on how warm it is in the area the jars are sitting in. If it’s about 75 – 80 degrees F, it should take 7 – 10 days. Every couple of days you’ll want to crack open the lid to let off any gas that is building up. You should see some fine bubbles developing on the top of the liquid after a few days. As the garlic ferments it will become translucent. Don’t be alarmed if the liquid turns milky. This is not a problem. The only problem that may arise is mold and that means you did not use enough salt in your brine. Taste your garlic when it starts looking translucent and see if you like it. The texture should be softer than fresh garlic and the taste will be much tamer. Store in refrigerator once it reaches the desired textures. It will mellow out even more over the months to come in the refrigerator. You can eat a clove or two a day of fermented garlic to ward off vampires and increase immunity! Also, add fermented garlic to homemade salad dressings. You can also add the fermented liquid in the jar to salads. If you heat up the garlic, you will kill the probiotics that have developed in the fermentation process. 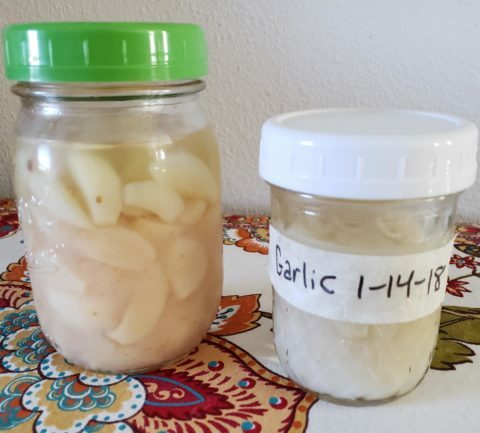 PreviousPrevious post:Nature’s Flu Shot – Fermented Garlic!NextNext post:That’s Okay, I Make Lamb!